The SHSM enables students to customize their high school experience to suit their interests and talents and prepare for a successful post secondary transition to apprenticeship training, college, university, or employment, while meeting the requirements of the Ontario Secondary School Diploma (OSSD). The SHSM enables students to gain the sector-identified preparatory credits, skills and knowledge, and make informed career decisions. This makes the learning environment more engaging for students, focuses them on graduation and prepares them to pursue their career goals. To learn more about the process or to start the process you can download the following documents. These documents are designed to help you through the process of being accepted into any Specialist High Skills Major program. What are the highlights of these programs? Engage in ‘reach ahead’ experiences that range from experiential learning a few hours in length to full courses. Receive relevant training that will lead to any post secondary destination and assist with easy transition into the workplace. When do students start a SHSM? Students are able to enter a SHSM based on readiness and alignment of the program with their interests and post secondary goals. Entry should occur no later than Year 3 in order for the student to be appropriately scheduled into the required courses. See the SHSM process at right. To learn more about the process or to start the process you can download the following document. 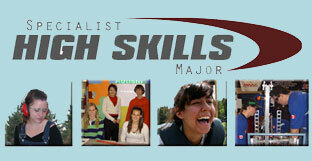 This document is designed to help you through the process of being accepted into a SHSM program. You may also pick up a complete package from the School to Career Guidance contact at your present school to book a visit or interview. For the name of the School to Career Contact at your school go to our Contact Us page. Tweet us at OYAP Halton for more information about apprenticeship and our great OYAP programs. Like us on Facebook at HDSB Pathways.